Some good news in the land of browsers. Firstly, the Chrome team has released a new beta that features impressive performance numbers to go along with HTML5 features that have all been baking in the developer channel. 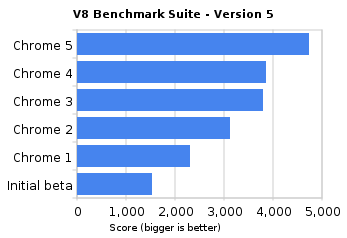 Seeing V8 get faster is exciting for me personally. Not only does it mean Chrome gets faster, but I also get the advantage of a faster webOS and a faster node.js! Under the hood, today’s release contains the goodness of some new HTML5 features, namely Geolocation APIs, App Cache, web sockets, and file drag-and-drop capabilities. I wish I was as impressed with my Firefox nightly as you. The Mac OS X ones don’t come anywhere close to Chrome or Safari in terms of low CPU, Flash performance, memory, and start up times – and that’s not even comparing against Safari or Chrome nightlies. Looks like IE is below 60% not IE6 (which ofc is also below 60%). Where are the browser stats from? I said explicitly “And in the global market share game, at least according to net applications” but added a link. Good point. absolutely. That is what is so fantastic! I’m curious, does anybody know what app was used to make the graphs from Net Applications? Chrome is awesome BUT I have uninstalled it because I don’t like the automatic updates without any permission. Chrome is not only updated but Google Earth too and shortcuts are put on the desktop. It’s MY desktop and if I don’t want Googles icons it’s my rights. What else sniffs Mr. Google in our computers? @p4: Err, it’s a well-known fact that Chrome auto-updates, and considering the frequency with which browser vulnerabilities are found, as well as the hostile environment that it exists in, I find it a good thing. I’m not sure what you mean by Google Earth being updated, doesn’t happen on my end, but perhaps you installed the Google Pack? Either way, I don’t find it particularly worrying. And if you’re that worried about “Mr. Google” (sic) collecting data, go have a look at the source code for Chromium, which they offer freely. Anyway, if you think Google is part of some weird global conspiracy, just don’t use their products, and don’t use their search engine. Personally, I always find conspiracy theorists amusing – look, Googles in it for money, ok, they don’t hide that, they make money from advertising. But they also happen to be a bunch of nerds who like cool things (at least the Googlers I know). And maybe they figure that making the Web a better place makes their apps more attractive, which eventually converts to advertising dollars. Either way, they provide a good service, and until they are exposed as some weird Skynet conspiracy, I’m happy to sign up. Their track record on installing spyware or malicious code so far has been…well…pretty flawless? Lol. As a disclaimer, I want to say that no offense is meant with the following because it seems like you’re trying to promote something approaching reason and critical thinking, albeit with some failings. With that said, I think your response basically mischaracterized p4’s comment as an extreme which it doesn’t represent (a straw-man fallacy) and snuck in an equally extreme counterpoint masquerading as something of a reality check. Pointing out that Google has deployed code which runs without user initiation is not a conspiracy theory, it’s a statement of fact. It may not worry you, but it worries some, and that worry is not without solid reason itself. You also conflated this statement of fact with a more extreme position—that Google’s (well-known) data mining represents some kind of secret, nefarious purpose—but that claim was not present in the comment you responded to. It’s true that p4 was questioning Google’s intrusiveness, but there is a difference between questioning overt intrusiveness and identifying that intrusiveness with something covert and misleading. With all of that said, I think there’s a strong case to be made that even such overt intrusiveness is itself an affront to privacy without a secret purpose behind it, and even if one cannot agree with the preceding clause that skepticism of that kind of intrusiveness is healthy and well below any reasonable threshold of unwarranted paranoia. Lastly, I want to say that my motivation to call your response out came primarily from your comment that p4 is free to stop using Google products—immediately following p4’s own comment stating that they removed Google software from their computer—as it betrays a sort of visceral knee-jerk emotion in your response. Through this it was clear that you were less concerned with what p4 actually said, and more concerned with projecting a straw-man position onto that poster so that you could tear it down. If you think that Google—which is increasingly scrutinized for overstepping privacy bounds—is a stand-up company which deserves to be defended, you might make your case more effectively if you engage people only on what they say and not what you would like them to have said. @eyelidlessness: Don’t worry, none taken *grins*. I always find Ajaxian to be an awesomely friendly place with great people. Firstly, you accuse me of using a “straw man fallacy”. I’m assuming here you and everybody else here know what one of these is. P4, in his original post said “What else sniffs Mr. Google in our computers?”. Strange grammar aside, I think what our erstwhile friend is suggesting is that, well, Google is sniffing things on his computer. That’s exactly the point I was refuting. So no, there wasn’t a straw-man fallacy here. I mean, what else do you think the word “sniffing” means? The issue of auto-updating I think is an interesting one. Let’s run through this, step by step. By the way, this isn’t directed primarily at you, but really at all the people out there complaining about Google Chrome’s auto-update – I’m not sure what your position on this is. I think everybody on Ajaxian knows that most leading browsers have been exposed to one or more remote-code exploit vulnerabilities at some point in their lives. A browse of Secunia (http://secunia.com/) or Security Focus (http://www.securityfocus.com/) would quickly show this to be true. Secondly, we all know the web to be a dangerous place. Malware authors breed like rats, and there are many hundred of in-the-wild exploits against browsers. So intent, and means are both there. Thirdly, we know, as computer professionals, that unpatched software, particularly unpatched browsers, in a hostile environment like the web is bad for users. It leads to them going to dodgy websites, getting breached, then coming to people like us for help. Now, on the flipside, we have this issue that Google is deploying code without user initiation – i.e. it’s auto-updating feature. Firstly, you’ve already installed Google Chrome. If you didn’t trust Google, absolutely and completely with your system, it’s game-over here already. You’ve already let them run arbitrary code on your system. But say you do trust them, at least to install Chrome. The premise here is that they’re releasing over-the-air updates to keep your browser up-to-date. Now, I’m not sure whether anybody prescribes malicious intent to Google. I certainly don’t – they’re a money-making machine and they want me to click on ads, but I don’t really see them intentionally screwing over my machine to do that – nor would it escape notice. The source code for both the browser, as well as any updates is freely available (http://code.google.com/p/chromium/). In all the years they’ve been around, they’ve never actually done anything malicious, as such – and that’s a reputation I’m pretty sure they’d like to keep. Now, I run the Dev branch of Chromium, and I have screwed up my browser from time to time, due to breakages in trunk. However, that’s just part-and-parcel of running dev. So if it’s not malicious intent, then you might argue that updating to the latest version might break something – but in that case, you’re just trading off known bugs (and security flaws) in the code, for potential bugs that might, possibly be introduced with updates – but you’re not sure, you’re just guessing they might be there. You realise that you’ve just basically argued against any form of software development or updates? Lol. Bugs are a part and parcel of life, and in a fast-moving and hostile environment like the web, with users who will click on anything and everything, I think it makes sense for them to be up-to-date. We in the security fields know how important it is to stay up to date on patches, so I don’t think it’s unfair to expect users, who may not know how important it is, or why we find it annoying to have to cleanup their systems, to also stay up-to-date. And those users are never going to read changelogs, or follow mailing lists, so it makes sense to auto-update. Would you accuse a anti-virus vendor of being malicious, if they defaulted to auto-updating their virus signatures? I think you’d have to be pretty silly to install their product, then not keep it up-to-date. A web browser, with all its potential vulnerabilities and all those attackers out there, is very much like that. Finally, I’m going to end on two points. One, Google’s been around for what, 12 years? (founded 1998, from memory). In all those years, have they ever been accused of pushing out any malicious software to their users? Isn’t their track record flawless, at least in this area? (Other areas…yeah…lol, but that’s another story). And secondly, it’s an open-source project – how exactly would you presume they could push out anything to their users, and not have anybody find out?